Reasonable operation costs: cheap fuel, high efficiency, easy maintenance. High durability: sturdy Diesel components, no valves, no ignition system. Use of world-wide available fuels. As with any leading edge technology, precise schedules are difficult to predict. We expect to ship the first production engines one year after Engine Type Certification. The 300 and 150 hp aero-diesels will be first on the market, to be followed by the 70 hp ZO 03A. The retail price of aero-diesel engines will be highly competitive with those of conventional gasoline aircraft engines of similar horsepower output. But as exchange rates vary and prices for parts supplied by other companies may change, final prices will be available only at the begin of series production. The price of the aero-diesel being similar to that of a gasoline engine, major savings are to be expected through reduced operating costs (fuel price, fuel consumption, maintenance). It must be stressed that fuel and maintenance costs for any type of aircraft engine, during a 2000 hour cycle, are much higher than the initial cost of the engine. A concurrent certification scheme, where both the German and U.S. Aviation Authorities are involved, covers engine type certifications to JAR-E and FAR 33. Retrofitting of aviation engines is a demanding task and involves advanced engineering skills, flight test activities as well as a serious certification effort in order to gain the required Supplemental Type Certificates (STC´s). We assist retrofitters, offering advice regarding e.g. engine mounting and cowling designs, to encourage retrofits, to reduce costs, and to accelerate these developments. These STC´s should become available from airframers and specialist companies who also will supply the installation kits. We expect to see STC´s for various popular airframes (e.g. Cessna, Beech, Mooney...). By supplying not only engines, but comprehensive system solutions, the design of new airframes shall be encouraged and assisted. Only certified engines will be sold for aviation use. We consider the certification as a further proof of the design validity and production quality. We do not follow the habit of other manufacturers who sell their engines with or without certification for substantially different amounts of money - putting the disadvantage on the customer who needs a certified engine while offering uncertified engines of the same quality at low prices. Prototype engines or uncertified pre-series engines are not generally available. Only selected airframers will be supplied with "early" engines for airframe certification / STC purposes. Basically the aero-diesel can be installed in tractor and pusher configurations. Similar to every air-cooled engine, cooling conditions have to be critically evaluated. The aero-diesel also is suited to helicopter applications (with crankshaft in a vertical position). JAR-E and FAR 33 certifications shall include helicopter applications (with slightly reduced ratings). Currently a reverse-flow, nose-slot cowling design is evaluated. In this exceptionally clean design, the incoming air is ducted through the lower cylinder fins, then reversed, and ducted over the top of the cylinders. The cooling air exits through an adjustable "nose slot" at the very front of the cowling, using the negative pressure at this point around the cowling. A derivative of this design has been well proven in the Focke-Wulf 190 fighter aircraft fitted with a 14-cylinder, air-cooled BMW radial engine. Further to this design layout, even more uncommon cowling designs are under investigation. 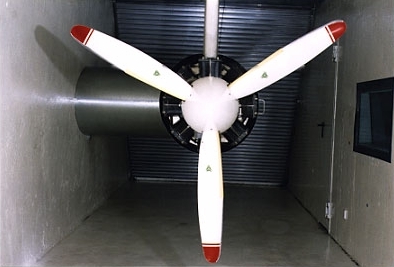 Cooling behaviour and cowling designs are tested in our own wind tunnel, where air speeds of 150 mph can be reached. One of our goals is to offer complete, optimized firewall-forward packages, including the engine, mounts, mounting frame, cylinder baffles and cowling components. This "system approach" leads to most effective engine installations. It must be stressed that poor installations may severely affect airplane performance as well as engine cooling. Low NOx, CO and soot emissions due to dry-sump lubrication and clean-air scavenging. Modern, effective high-pressure direct fuel injection further reduces emissions. Very low noise emission due to two-stroke principle and turbocharging. No clattering valve gear, no "diesel knock". The aero-diesel basically can be operated with Diesel fuel and a variety of Jet fuels. The use of Diesel fuel might be restricted as it is not a certified aviation fuel. Fuel clogging in the fuel lines is prevented by the pre-warmed fuel return: 90 % of the fuel flow is returned to the tanks after being pre-warmed in the engine. Jet fuel should be readily available on every airport and more reasonably priced than Avgas. Currently we (rather conservatively) quote sea-level power at 9,000 ft. We expect to maintain sea-level power up to 25,000 ft, but this will have to be confirmed in flight tests. We have accumulated thousands of hours of bench testing with engines assembled out of components produced in quantity production tooling. Testing is done in our own windtunnel test bench where we can simulate realistic cooling conditions and optimise the installation efficiency. A TBO of 2000 hours is anticipated. In accordance with certification practice, however, early production engines will have a substantially lower TBO. This will be increased according to field experience. Currently a novel buy-back scheme is planned where aero-diesels, having reached their TBO, will be returned to the factory and replaced by new ones at the cost of a conventional overhaul. Thus, multiple engine overhauls and/or repairs can be avoided. Also, downtime will be considerably reduced. Returned aero-diesels will be downgraded and modified for secondary uses, e.g. water pumps, and may not be used again in aircraft. Basic engine maintenance is rather simple, consisting mainly of oil change, filter change, and the usual visual checks. Without valves, valve gear, and ignition systems, the aero-diesel needs less comprehensive maintenance procedures than conventional gasoline aircraft engines, thus reducing downtime and further saving operating costs. Should major repair work become necessary during the warranty period, it is planned that the engine shall immediately be replaced with a factory new unit. Due to quality control reasons field repairs should be avoided where possible, with repair work being conducted only in the factory or authorized service centers. The engines are sealed to prevent unauthorized repairs or modifications. Routine maintenance, of course, will be handled in the usual manner. As the weight difference between the 150 and 300 hp aero-diesels is only 86 lbs., there will not be a e.g. 200 hp version of our engines. The 150 hp aero-diesel should be able to replace a conventional 200 hp gasoline engine due to its low weight. On the other hand, the 300 hp aero-diesel can be derated to e.g. 200 hp while still being much lighter than an equivalent gasoline engine. There will be liquid cooled versions for industrial and marine applications. There are no dealerships so far, as we do not sell engines yet. Realizing that a proficient service network is highly important, we will make sure that our products will be well supported in most countries. Among the applicants, a selection will be made depending on individual qualifications and experience.